Home » Family » Do you teach your kids about money? Do you teach your kids about money? When we were growing up, we were taught math, but we were not taught about money. Our parents tried to teach us about money. While my parents were very thrifty and money smart, I must admit that I was the opposite of my parents. My sisters were different. I am now much more more money smart like my parents, but it happened later than I would like to admit. Money. We all love money. We love to spend money. We don’t like to save money. I think it is realy important to teach your kids about money when they are young. Tangerine Bank is hosting a twitter party to discuss just that. Robin Taub will be their guest expert on the chat. Robin Taub is a chartered professional accountant (CPA, CA) and currently works as a financial literacy consultant, speaker and blogger. She is also the best-selling author of A Parent’s Guide to Raising Money-Smart Kids. Follow her on twitter @robintaub or visit her website http://www.robintaub.com to learn more. You can also review the posts she has created on the Tangerine Blog. Anyone can participate in the twitter party but only those who live in Canada excluding the province of Quebec are eligible to win prizes. 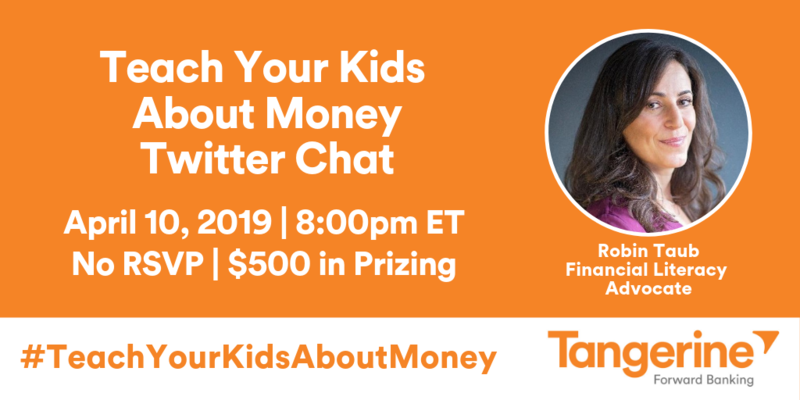 Well, if you want to start thinking about talking to your kids about money, then we thought you might need some though starters along with some links to some great content that can help you.